Pierre-Narcisse Guérin (1774–1833), Aurora and Cephalus (1810), oil on canvas, 254 x 186 cm, Musée du Louvre, Paris. Wikimedia Commons. This is the second of two articles which together show eleven of the very best stories and the finest paintings from the first half of Ovid’s Metamorphoses. A full list of articles and an index to all the characters involved is available here. Pyramus (the man) and Thisbe (the woman) lived in the city of Babylon, in houses which shared a common wall. They fell in love with one another, but their fathers refused to let them marry. They communicated through a crack in the party wall between the two houses, talking together until nightfall. They resolved to meet outside the city, at the tomb of Nisus, after dusk, under a mulberry tree with its white fruit. Thisbe arrived first, but while she was sitting under the mulberry tree, a lioness came to drink at the nearby spring, her face still covered in blood from her recent kill. Thisbe fled to hide in a cave, leaving her shawl on the ground, which was then torn by the lioness as she walked away from the spring, leaving blood on the material. Pyramus arrived after the lioness had gone, but saw her footprints, and discovered the bloody and torn shawl by the mulberry tree. He immediately presumed that Thisbe had been killed by the creature, and blamed himself for putting her at risk. Draping the shawl over the tree, he kissed it, then killed himself by thrusting his sword into his side. This caused his blood to spurt high in jets, which coloured the mulberry fruit hanging there. Thisbe then tentatively left the cave, and made her way back to the mulberry tree, which she found hard to recognise because she could not see its white fruit. She there discovered her dying lover, lifted him up, and kissed him. As he died, she blamed herself for his death, and decided to join him in that death. She took his sword, placed its point below her chest, and fell onto it. In her last words, Thisbe asked that the couple should share the same tomb, so that they could finally rest together, and that the fruit of the mulberry tree should forever bear the mark of their deaths. Both of these wishes were respected: their parents put their ashes together in the same urn, and the gods transformed the mulberry fruit from white to red. 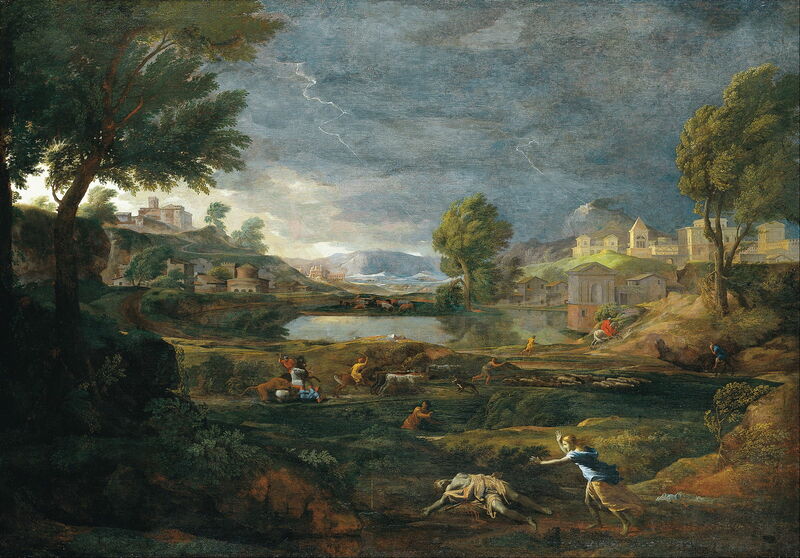 My favourite painting of this story, and surely its most famous, is Poussin’s Landscape during a Thunderstorm with Pyramus and Thisbe (1651), which succeeds in telling the story and in being one of his finest landscapes. Nicolas Poussin (1594–1665), Landscape during a Thunderstorm with Pyramus and Thisbe (1651), oil on canvas, 274 × 191 cm, Städelsches Kunstinstitut und Städtische Galerie, Frankfurt, Germany. Wikimedia Commons. The city of Babylon is in the distance, along a picturesque and pastoral valley. But the peacefulness of this landscape has been transformed by the sudden arrival of a thunderstorm: the gusty wind is already bending the trees, and near the centre of the view has broken a large branch with its force. Two bolts of lightning make their way to the hills below. There is frantic activity in response not only to the storm, but to a lioness which is attacking a horse, whose rider has fallen. An adjacent horseman is about to thrust his spear into the back of the lioness, while another, slightly further ahead, is driving cattle away from the scene. Others on foot, and a fourth horseman, are scurrying away, driven by the combination of the lioness and the imminent storm. In the foreground, Pyramus lies dying, his sword at his side, and his blood flowing freely on the ground, down to a small pond. Thisbe has just emerged from sheltering in the cave, has run past the bloodied shawl at the right, and is about to reach the body of her lover. She is clearly distraught. After Perseus had cut Medusa’s head off, and with blood still dripping from it to form snakes in the sand beneath, he flies over the Libyan desert. With dusk approaching, he decides to set down in the lands of Atlas, the giant. Perseus introduces himself to Atlas, citing his divine paternity, and asks for rest and lodging for the night. The giant, mindful of a prophecy that a son of Jupiter will ruin him, rudely refuses the request, and starts to wrestle with his spurned guest. Perseus responds by offering him a gift, then (averting his own face) points Medusa’s face at Atlas, who is promptly transformed into a mountain. With dawn about to break, Perseus gets himself together and flies away on his winged sandals, which had been given by Mercury for his mission to kill Medusa. He flies over Ethiopia, then ruled by Cepheus, where he sees the beautiful Andromeda shackled to a rock. He immediately falls in love with her, and descends to chat her up. Andromeda tells him a bit about herself, and is just about to explain the full story of how she came to be chained to a rock, when a huge monster rises up from the sea and heads towards the woman, to devour her. With her parents stood helplessly by, Perseus offers to save her, in return for her hand in marriage; as they have no option, her parents consent, as the monster closes in on them. Perseus takes to the air again and sinks the curved blade of his sword into the monster’s shoulder. The monster rears up, dives down, then reappears, for Perseus to wound it further. His winged sandals are now soaked with spray and blood, and struggling to keep him airborne. He therefore lands on a small rock, from where he finishes the monster off. Andromeda is released, and Perseus first washes his hands, then carefully places the head of Medusa in a bed of seaweed, which is transformed into coral as a result. Perseus makes offerings to the gods, and prepares for his wedding with his newly-won bride. 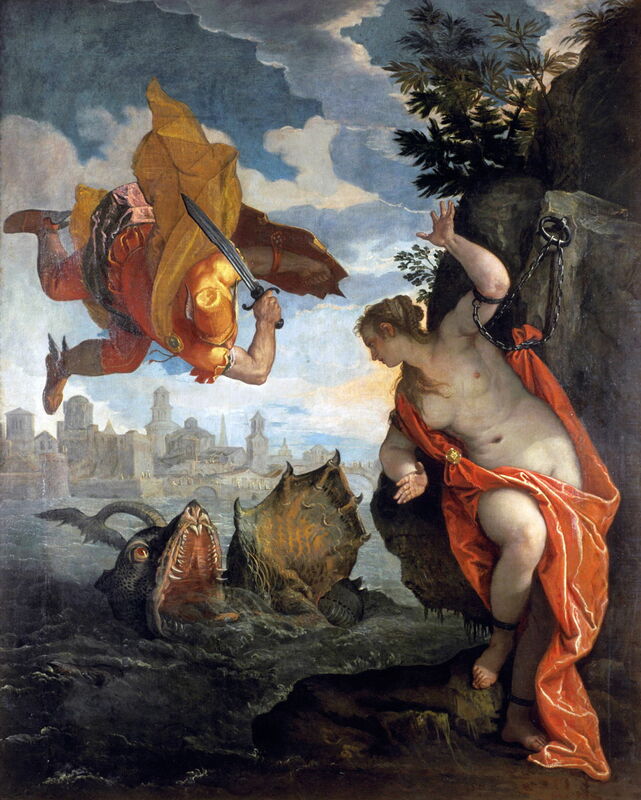 Paolo Veronese (1528–1588), Perseus Rescuing Andromeda (1576-78), oil on canvas, 260 × 211 cm, Musée des Beaux-Arts, Rennes, France. Wikimedia Commons. Paolo Veronese’s Perseus Rescuing Andromeda, painted in 1576-78, is faithful to Ovid’s text, with attention to the details of Perseus and Cetus which bring the image to life, making it one of the finest depictions of this scene. When King Minos of Crete is preparing for war against Greece, Cephalus visits the allies of Athens to engage their support. Cephalus carries a distinctive javelin, bearing a gold tip on a shaft of strange wood, which killed his wife Procris in a series of tragic events which Cephalus reveals. Within two months of his marriage to the beautiful Procris, when he was laying nets to catch a deer at dawn, the goddess Aurora saw Cephalus and tried to abduct him. Cephalus protested and explained to Aurora his love for his wife, and she let him go, warning him that if the goddess saw him again, he would regret ever marrying Procris. As he went back to his wife, Cephalus started to worry whether his wife had been unfaithful to him. He became aware that Aurora had changed his appearance, and entered the city of Athens unrecognised. When he got home, his household and wife didn’t recognise him either, so Cephalus put Procris to the test: with his wife still thinking him a stranger, he offered her great riches to spend a night with him, and managed to get her to waver with uncertainty. He then revealed himself to be her husband, and accused her of being unfaithful. She said not a word, but fled to the mountains, where she joined the followers of Diana. Cephalus yearned for his wife, so begged her forgiveness, and admitted that he too would have given way when made such an irresistible offer. Procris returned to him, and the couple lived happily together again. She brought back with her gifts from Diana: a hunting dog who outran all other dogs, and the unusual javelin. Then the city of Thebes was put into difficulty again, after Oedipus had broken the siege imposed by the Sphinx. This time the problem took the form of a wild beast which ate all its livestock. All the younger men, including Cephalus, went to hunt for the beast, but it eluded them and their dogs. Cephalus then unleashed Diana’s hound to chase the beast. The dog caught the beast, but it broke free again. Cephalus prepared to throw his javelin, then noticed that his dog and the beast had suddenly been transformed into marble statues. Cephalus returned to his now blissfully happy marriage with Procris. He went hunting alone at dawn, always feeling safe with his javelin. As the heat of the day came on, he would call on an imaginary zephyr of the cool breeze, talking to it as if it was a real nymph. One day he must have been overheard, and word was taken back to Procris that he was meeting a woman when he was supposed to be hunting. His wife was shocked, but refused to accept the story without herself witnessing her husband’s deceit. The following morning, Cephalus was out hunting at dawn again, and when he grew hot, he rested and spoke to his imaginary zephyr as usual. He thought that he heard a sound nearby, which he suspected was an animal. He turned and threw his javelin at that noise. He next heard his wife’s voice, rushed towards it, and found her mortally wounded, with his javelin buried in her chest. He took her up into his arms and tried in vain to stop blood from pouring from the wound. Knowing that she was dying, Procris implored him not to take the zephyr as his wife. He then realised the fatal misunderstanding, that Procris believed that he had been unfaithful. As Procris died in his arms, Cephalus tried to explain to her that the zephyr was only imaginary, and that seemed to bring her some comfort in her last moments. There has been a steady stream of paintings showing the abduction of Cephalus, one of the best being Pierre-Narcisse Guérin’s romantic Aurora and Cephalus (1810). 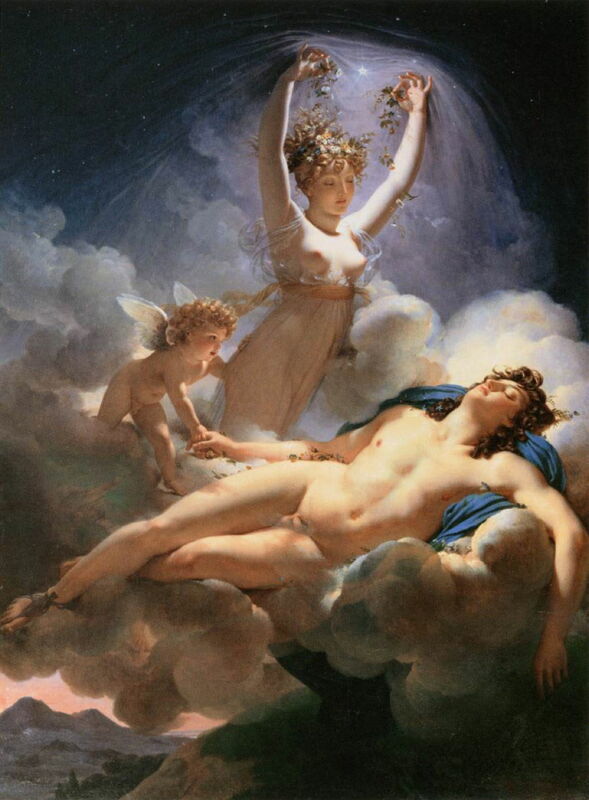 Instead of using a substantial chariot, the seductive figure of Aurora is bearing a sleeping Cephalus aloft on a bed of cloud, as dawn breaks over the mountains below. After he had built the labyrinth to contain the Minotaur on Crete, Daedalus – who was not a Cretan, and was being held on the island by Minos – yearned to leave Crete and return home. With the sea barred to him, he decided to take to the air. Daedalus built himself, and his son Icarus, sets of wings made from feathers held together by beeswax. Once they were completed, Daedalus tested his by hovering in the air. He then cautioned his son to fly a middle course: neither so low that the sea would wet the feathers and make them heavy, nor so high that the heat of the sun would damage them. He also told Icarus to follow his lead, and not to try navigating by the stars. Daedalus fitted his son with his wings, and gave him further advice about how to fly with them. As he did this, he shed tears, and his hands trembled. Once they were both ready, Daedalus kissed his son, and flew off in the lead just like a bird with its fledgeling chick in tow. The pair flew over a fisherman holding his rod, a shepherd leaning on his crook, and a ploughman with his plough, amazing them with the sight. They flew past Delos and Paros, and approached further islands. But Icarus started to enjoy the thrill of flying too much, and soared too high. As he neared the sun, the wax securing the feathers in his wings softened, and the wings fell apart. As Icarus fell, he called to his father, before entering the water in what is now known as the Icarian Sea, between the Cyclades and the coast of modern Turkey. All Daedalus could see were the feathers, the remnants of wings, on the surface of the water. Daedalus was full of remorse, and buried his son’s body on the island nearby. Pieter Brueghel the Elder (1526/1530–1569), Landscape with the Fall of Icarus (copy of original from c 1558), oil on canvas mounted on wood, 73.5 × 112 cm, Royal Museums of Fine Arts of Belgium, Brussels. Wikimedia Commons. In addition to painting his own version of this story, De Momper may have made this copy of Pieter Brueghel the Elder’s famous Landscape with the Fall of Icarus. Here, Brueghel makes the viewer work hard to see the crucial elements of the story: all there is to be seen of Icarus are his flailing legs and some feathers, by the stern of the ship at the right. Daedalus is not visible at all, but the shepherd leaning on his crook is looking up at him, up to the left. 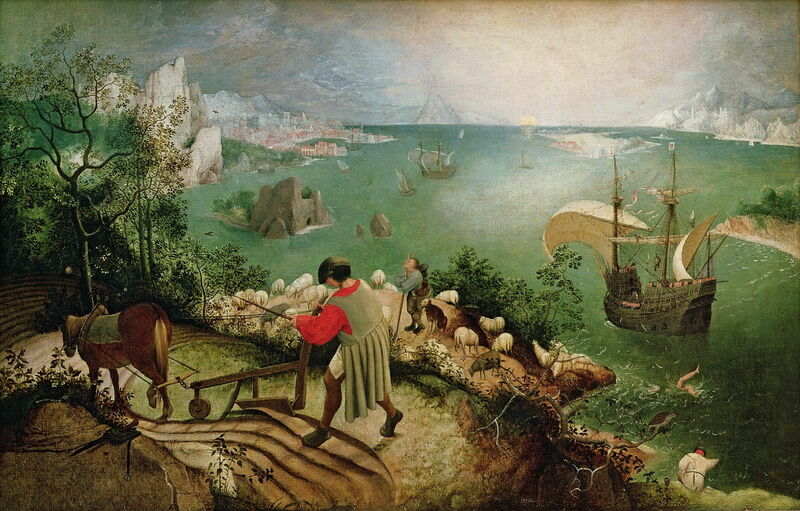 Brueghel also shows Ovid’s ploughman and the angler. With the Minotaur dead, and Daedalus welcomed to Sicily, Theseus was sought to bring help to Calydon, which was being plagued by a monstrous wild boar, the vengeance of Diana. Ovid provides a vivid description of the beast, as big as an ox, which Diana had unleashed on the city and its surrounding area, destroying crops and livestock. A long list of heroes were summoned to hunt the boar: Theseus brought Pirithous, Telamon the son of King Aeacus came, Meleager from Calydon itself, and more than a dozen others. With them came a young woman, Atalanta, who was plainly dressed, and for whom Meleager took an immediate fancy. The hunters travelled to very dense ancient woodland to trap the boar, and laid their nets, released their dogs, and set about trying to track their quarry. They found the boar at the boggy bottom of a deep gully, where he rushed at them. Several threw their javelins, but none hit the beast, who charged at the men, goring several of them fatally before returning into a dense thicket. Telamon tripped over in his pursuit, and as he was helped up, Atalanta loosed an arrow from her bow, which grazed the boar’s back and buried itself into the animal’s head just below the ear. Meleager praised her for this first success. Ancaeus then boasted at how his weapons would surpass those of any woman, and raised himself to bring his double axe down on the boar. The beast gored him before he could strike; Ancaeus was disembowelled, and died. Pirithous threw his spear, which struck the branch of a chestnut tree, and Jason’s javelin impaled one of their dogs, pinning it to the ground. At this stage, the efforts of the heroes had been at best amateur, if not farcical. It was now up to Meleager, whose second spearshot struck home, in the boar’s back, allowing him to finish the beast off quickly. Meleager stood, one foot on the boar’s head, and gave his prize to Atalanta, to share the glory with him: he gave her the skin and head with its tusks as large as an elephant’s, which delighted Atalanta too. Peter Paul Rubens (1577–1640), The Hunt of Meleager and Atalanta (c 1616-20), oil on canvas, 257 × 416 cm, Kunsthistorisches Museum, Vienna, Austria. Wikimedia Commons. 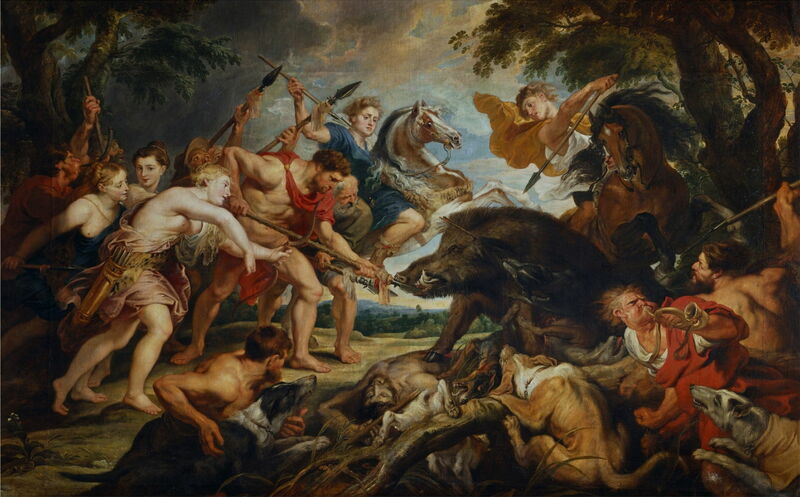 Rubens’ first painting of this story was completed around 1611-12, but he later decided to strengthen his composition in a second version, The Hunt of Meleager and Atalanta from around 1618-20, and now in Vienna. This places its visual centre close to the geometric centre, brings the gaze in using a range of radial lines, and gives Atalanta a more active role. The boar rests its hoof on the body of Ancaeus, and the centre of the painting includes a landscape, with bright sky emphasising the visual centre. Posted in General, Language, Life, Painting and tagged Brueghel, Guérin, Metamorphoses, myth, Ovid, painting, Poussin, Rubens, Veronese. Bookmark the permalink.